Mumbai Police vs Hotel California: Tears or tiara at box office? 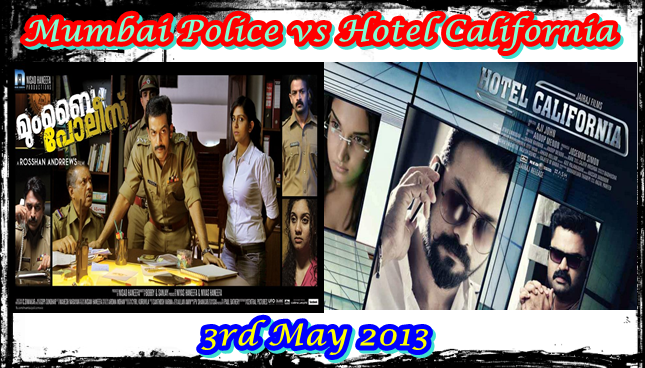 Mumbai Police and Hotel California malayalam movies release date are confirmed for 3rd May 2013. What is the result of these malayalam movies in box office? Mumbai Police under the direction of Rosshan Andrrews is gearing up to thrill the audience while Aji John's Hotel California is an action comedy movie flavoured with all essence to keep the viewers intact. What would be the fate of both the movies at the box office? Let us find it. As the much expected Vishu release movies couldn't do good business at box office, all eyes are on the two biggies which are gearing up to enthrall the family audience. The much hyped 'Mumbai Police' and 'Hotel California' featuring the young brigades in malayalam film industry are getting ready to reach theatres. With both movies shouldering much expectation are set to release on 3rd May 2013. Mumbai Police had created a huge buzz as from its official announcement in 2010. When a mighty director team up with brilliant writers and the best young actors in the industry, the product would be exceptional. Film maker Rosshan Andrrews who proved his mettle with his directorial debut 'Udayanaanu Thaaram' is back in driving seat. This extraordinary investigation thriller penned by Bobby-Sanjay will feature the vibrant youngsters Prithviraj, Jayasurya and Rahman in lead supported by Anoop Menon, Meera Nandan, Aparna Nair, Hima Davis, Kunjan, Mukundan, Chali Pala, Captain Raju and Harish. Mumbai Police pools into the deep friendship of 3 police officers and a murder investigation. Unlike usual normal police stories, 'Mumbai Police' tagged under the genre of suspense thriller narrates the story of three vibrant police officers. Ernakulam Assistant Commissioner Antony Moses (Prithviraj), Mattancherry Assistant Commissioner Aryan John Jacob (Jayasurya) and City Police Commissioner Faran (Rahman) shares close friendship generate nightmare to the underworld mafia of Kochi city. These fearless and efficient officers of Mumbai Police are employed at Kochi but do have connections with Mumbai too. When the three officers join to solve a murder mystery, then unfolds some incidents with suspense which changes the whole mood of the movie. Debutant Hima Davis will don the role of Rebecca, the lady love of Jayasurya. Produced by Nisad Haneefa and co-produced by Nivas Haneef and Niyas Haneefa, the movie will have the grandiose music composed by Gopi Sunder. The camera works performed by G. Diwakar would bring the real visual treat for the viewers. Hotel California too pushed the pulsation of the youngsters from the early time of the announcement of the project. Titled first as Pushpakavimaanam, the name was changed to Hotel California later. Directed by Aji John and scripted by Anoop Menon, this action comedy movie features the young battalion Jayasurya, Anoop Menon, Honey Rose, Maria Roy and Aparna Nair supported by Shankar, Nandu, P.Balachandran and Saiju Kurup. Produced by Josemon Simon under the banner of Jairaj Films, the movie is blessed with the music composed by Shaan Rahman. The viewers would be truly lucky enough to watch the camera works handled by Jithu Damodar while the editing would be safe in the hands of Xian. Five people who come from five cities arrive at the Nedumbasserry Airport in Kochi. They do have their own motives in reaching Kochi. Even though not known to each other, one unique thing is that, they are clubbed together by a single person at Kochi. The five people are Super star Prem Sagar (Anoop Menon), Rafeeq a body guard from Dubai, Arun Singh a businessman Lakshman Prasad, an Engineer of Kochi Metro, and a young man. Five people are waiting to receive them at the airport. Airport Jiby (Jayasurya) is in duty to club all of them together for a reason. But the people who were present there to meet each other got shuffled. This confusion is humorously presented in 'Hotel California'. The flight scenes of the movie were carried out at the majestic sets of Ramoji Film City, Hyderabad. 25 Lakhs were exclusively spent to shoot inside airplanes and in airports. The movie also had locations set at Dubai and Colombo. Hotel California will be released on 3rd May 2013. So with two movies releasing on a single day – What will be your choice…. Will it be Mumbai Police or Hotel California? Waiting for the verdit….